I have been on a baking kick lately. 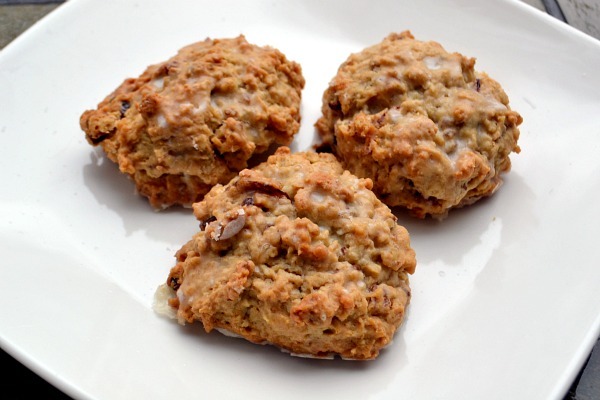 In the past couple of weeks I’ve baked these oatmeal maple scones twice, a hummingbird cake, peanut butter chocolate chip bars, pita bread and no-bake chocolate peanut butter oat cookies. The time in the kitchen has been relaxing and let’s face it…my sweet tooth is pretty out of control. When I’m in the mood for something sweet and to bake my go-to is usually cookies or brownies. I wanted to branch out a bit so I flipped through a cookbook that was given to me as a gift a few months ago, Flour. It’s full of amazing recipes from Boston’s Flour Bakery and Cafe. I haven’t made scones in forever and had all the ingredients on hand for their oatmeal maple scones. I expected the scones to be good but they were literally one of the best things that I have ever baked. So good that I had to make them again for my grandmother when I went to visit her the next week. 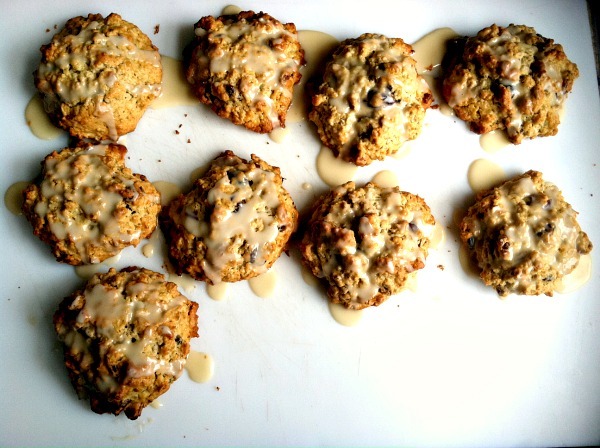 I love anything that is oatmeal based and the texture of these scones is perfect. The edges are slightly crunchy but the centers are soft and the toasted pecans and golden raisins add a contrast. The scones are sweetened with maple syrup and include a maple glaze that is a great final touch. The scones will keep at room temperature in an air tight container for a few days and they also freeze well. They might not seem too exciting but I promise you won’t regret making them for a breakfast (or anytime) treat! Using a stand mixer with the paddle attachment (or a hand mixer), combine flour, oats, baking powder, baking soda, salt, pecans and raisins on low speed until combined well. Add butter pieces and beat on low speed for about 30 seconds or until butter is broken down but with pebble sized pieces still visible. In a separate small bowl, whisk cream, maple syrup, vanilla and egg together. With mixer still on low speed, add wet ingredients to dry mixture and beat for about 30 seconds until just combined. Remove bowl from mixer and scrape down sides to make sure that all dry ingredients have been incorporated. Using a 1/4 or 1/3 cup measuring cup, drop rounded scoops of dough onto a baking sheet 2 to 3 inches apart. You should have 9 scones. Bake for 30-40 minutes, or until tops are golden brown. Start checking at the 30 minute mark. Transfer to a wire rack to cool for about half and hour. Make the glaze while the scones are cooling. Whisk together sifted powdered sugar, maple syrup and water. Once the scones have cooled, brush tops with glaze. If you keep the scones for more than one day or freeze them, they can be “refreshed” by heating in a 300 degree oven for about 5 minutes. I had to get the recipe when you first blogged about this on PBR so I checked out the cookbook from he library. The scones were delicious! The banana bread is also amazing and I highly recommend you giving it a try too! Ooo, Flour is an amazing bakery, and I’ve heard good things about their cookbook. If you ever come to Boston, you NEED to check it out. Great lookin’ scones. I found this after looking at these scones on PBR. These sound delicious and the perfect snack to keep on hand for when I need something quick to eat. I took these to a carry-in breakfast at school this week. They were a hit and everyone wanted the recipe. I will make these again!